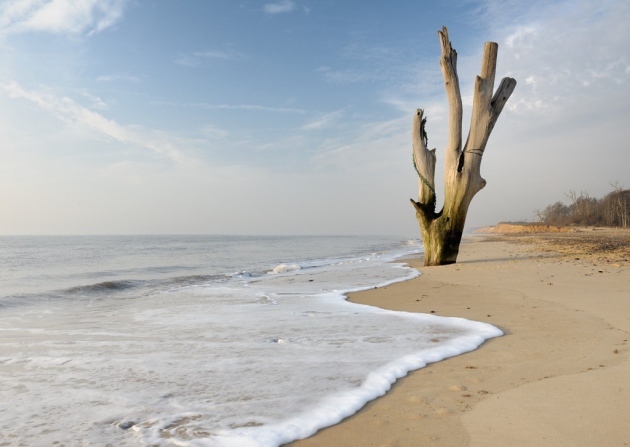 Suffolk has a gentle coast, mainly sand and shingle, with a few low cliffs. It faces the enclosed North Sea, so the rise and fall of the tide is slight—a couple of metres usually, compared with Cornwall’s 13-15m. The beaches tend to be fairly straight sections of coastline rather than picturesque bays, but the bathing is safe and, in the past, the fishing has been reliable. Being sheltered from the west winds that come off the Atlantic, the shore does not get pounded as often here as elsewhere. When the wind comes from the north, in a winter storm, however, the sand is easily eroded. The prevalence of smuggling along the Suffolk coastline, often thought of as a romantic interlude in the 18th and early 19th centuries, is also a very real concern for the port authorities at Felixstowe and elsewhere in the present day. With the building of the new harbour, Lowestoft developed into a major fishing dock, with herring the most important catch. There was a small herring fleet at Southwold but Lowestoft was surpassed only by its Norfolk rival, Great Yarmouth, just five miles north. The first East Anglian fishing boat to be steam powered was the ‘Consolation’, built in 1897; by 1914 there were about 350 steamers in Lowestoft. 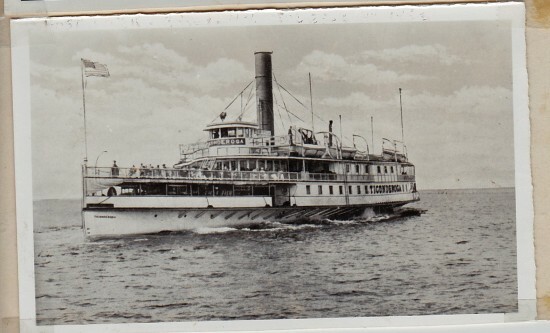 Diesel engines were first fitted to Suffolk boats at the beginning of the 1930s. Back in 1913, however—the year with the heaviest catches ever recorded—the vast majority of the 1700 or so fishing boats that collected in Yarmouth, Lowestoft and Southwold for the Autumn fishing were steam driven, accompanied by some scores of sailing drifters (drifting is the technique of trailing nets close to the surface, as opposed to trawling the seabed). The skipper of a drifter might have started as a cook’s boy, then risen through the ranks of deck hand, Third Hand and Mate before finally taking the exam to gain his Master’s certificate. The scenes of bustle in Lowestoft when the fishing fleet was in action were graphically recalled in the 1950s in a series of newspaper articles by H.H. Jay, now assembled in the book Fishy Tales. The activity at sea was matched by the frantic work going on ashore as the fish were unloaded, gutted, packed in ice (or cured if destined to be kippers), sold and transported. The early boats carried little but flares in the way of life-saving equipment. Vessels would help each other though, and there was the hope of rescue from the beach when close inshore. The Royal National Lifeboat Institution was founded in the 1820s, and the Coastguards, founded in the same decade, had lifesaving responsibilities added to their remit in the middle of the century. A number of individual lifeboat stations pre-date the founding of the national institution. The Lowestoft station was set up in 1801 and by 1996 had been credited with saving 1144 lives. Another mainstay of the Lowestoft economy for many years was ship-building, with companies like Richards and Brooke Marine being key employers for much of the 20th century. The companies made models of the ships that they built, many of which can now be seen in the town’s Maritime Museum. It also houses a good collection of the traditional tools of the trade. Tourism was another facet of life that grew in importance in the Victorian age. When the railway system was extended to reach Aldeburgh in 1860, Felixstowe in 1877 and Southwold in 1879, people started to visit in significant numbers. Hotels, guesthouses and amusements duly sprang up. Felixstowe also had the benefit of a spa, and its popularity rose even further in the wake of a royal visit in 1891: while the Emperor of Germany visited Queen Victoria—his grandmother—his wife and children enjoyed a holiday there. By the time the pier was opened in 1905, day-trippers were arriving in thousands for bank holiday weekends. From the 1930s to the 1950s many holidaymakers enjoyed a week at a Suffolk resort, but the advent of package holidays abroad led to a decline and tourism came to rely largely on caravan parks, and day trips during the school holidays. This was a setback common to most British seaside resorts, and it left many of them ‘all at sea’. 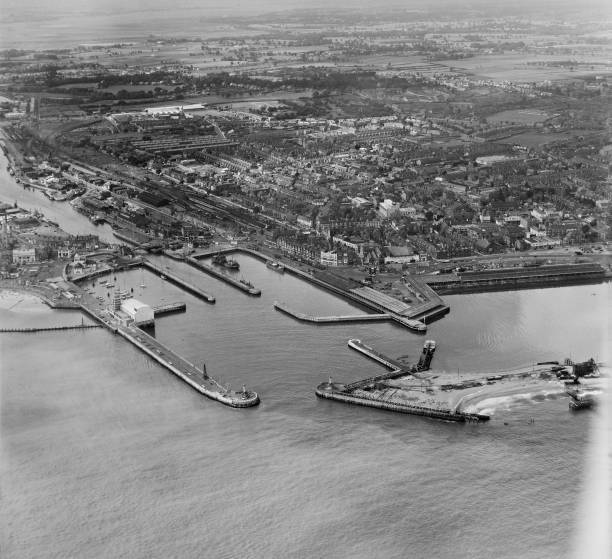 Lowestoft, however, was about to benefit from the North Sea gas and oil boom as it was well placed to act as a service centre for many of the rigs. This helped for a number of years, although off-set by the decline in fishing and ship-building. Felixstowe was even more fortunate, having the benefit of the container port, which expanded as tourism declined, and continued to flourish. Ipswich was for a long time the most important trading port in Suffolk. Then, in the 1960s, Felixstowe was equipped to handle the containers that were coming into use, since then it has developed into the leading container port in the country. Before the 20th century, a good deal of the passenger traffic and goods that would now be transported by road went by sea instead. Lowestoft, and also smaller towns such as Southwold, Dunwich, Orford and Aldeburgh, were ports of significance. In the case of Aldeburgh, the quay was actually at nearby Slaughden, which was lost to the sea early in the 20th century. Like Dunwich (which had been a major port in the early Middle Ages) Aldeburgh also extended much further east, until the sea encroached—this happened in Tudor times at Aldeburgh, earlier at Dunwich. Ironically Orford, to the south, also became inaccessible because material that had been eroded from the Dunwich-Aldeburgh area was deposited there in a long spit of sand that left the quay over ten miles from the open sea. When Lowestoft developed as an access port for Norwich, in the first half of the 19th century, keeping a harbour-mouth clear of sand was again a problem. This time it was solved, however, by the construction of an outer harbour, in the 1840s by Samuel Peto. Peto’s connection of the port to the newly developed rail system, and his opening up of trade with Denmark and the Baltic, was a 19th century development as dramatic, perhaps, as that of Felixstowe as a container port a century later.